Hand crafted from choice parcels of fruit grown to closely husbanded vines on the family owned Mount Fishtail property in Wairau Valley. Konrad Hengstler pays particular attention to retaining the barest amount of natural fruit sugar, in a fine balance of the juicy, refreshing acidity. A wonderful anywhere, anytime wine that's clean and crisp, always a classic expression of Marlborough, simply sublime alongside any recipe duckl or a spread of piquantly spiced Asian fare. Mt Fishtail's Waihopai and Wairau vineyards are moderate yielding, cool climate fruit parcels, closely cropped at four tons to the acre. The first blocks of vine were planted in the 1990s, in the highly favourable mesoclimes of Waihopai Valley. 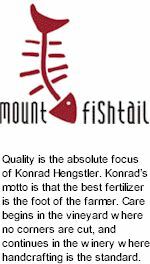 Quality is the absolute focus for Konrad Hengstler's Fishtail, it starts in the vineyard where no corners are cut. The attention to detail continues into the winery where every barrel is hand crafted from start to finish. Konrad's philosophy? That the best fertilizer is the foot of the farmer. Fruit is treated to controlled fermenters for optimal preservation of requisite Pinot Noir fragrant elegance, vibrant varietal complexity and seamless, velvety tannins.